If you have taken on a landscaping project at your home, or are looking too, you will need to familiarize yourself with some landscaping terminology. Some terms that will likely be thrown around quite a bit are softscaping and hardscaping. A beautiful green lawn, lush trees and plants and vibrant flowers all make for a beautiful landscape at any home. 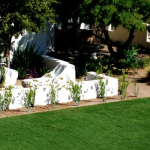 Every homeowner may hope to have a landscape paradise to enjoy and for much of the year, Arizona's climate is very conducive to healthy and beautiful landscape. One of the many benefits of homeownership is being able to host friends and families or other guests at your home. This may be for a casual get together or a formal event but either way, it can be incredibly fun and enjoyable to gather guests at your home. Planting trees, plants, flowers, shrubs, vegetables and fruit can lead to a beautiful landscape and delicious fresh food. But, Arizona has a climate that swings from quite pleasant with occasional bouts of cold all the way to sweltering heat. Because of the varying temperatures throughout the year, there are times when planting new plants of any kind should be avoided and times of the year when it is ideal for optimal growth. There are few things more enjoyable than spending some quality time with friends or family in your yard around a fire pit. 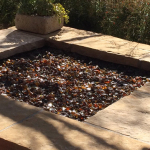 Telling stories, roasting marshmallows or sitting back with a glass of wine enjoying the crackle of the fire - no matter how you spend your time around it, a fire pit is sure to bring pleasure to any homeowner. 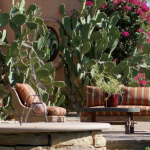 When you design a beautiful backyard or meticulously landscape your property, it is usually with the intention to spend a lot of time enjoying it.